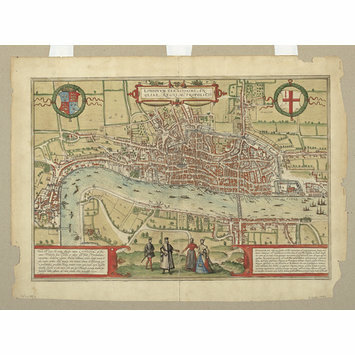 This is the earliest printed map of London, from Braun and Hogenbergh's Civitates Orbis Terrarum, a six-volume work printed in Cologne from 1572 to 1617 and one of the most important works from the early days of cartography and topographical illustration. It was the first systematic depiction of cities from all over the world, containing 363 views of cities, conceived and edited by the cleric and geographer Georg Braun (1541-1622). The majority of the engravings were by Franz Hogenberg (1535-1590), who executed most of the engravings for the earlier work edited by Braun, Ortelius' Theatrum Orbis Terrarum, generally acknowledged as the first modern atlas. The English cartographer William Smith provided maps for several of the English cities; others were copied from existing views, but the artist of this view is not known. Although the first edition of the Civitateswas printed in 1572, this map must have been drawn before 1561 since it depicts the spire of St. Paul's Cathedral that was destroyed by fire that year. The four characters in the front are a standard feature of these maps, added by Georg Braun to prevent the Turks using them for military purposes since their religion forbade them looking at representations of humans. Hand-coloured copper-plate engraving showing London from Westminster in the west to the Tower of London in the East, and the bull-baiting and bear-beaiting gardens on the south bank, with four elegantly dressed figures of two men and two women standing in the fields south of Bankside. The map is titled in an oblong ground top centre 'LONDINUM FERACISSIMI ANGLIAE REGNI METROPOLIS', to either side of which is a shield. At the lower right corners are two text boxes containing further information about the city and its people. 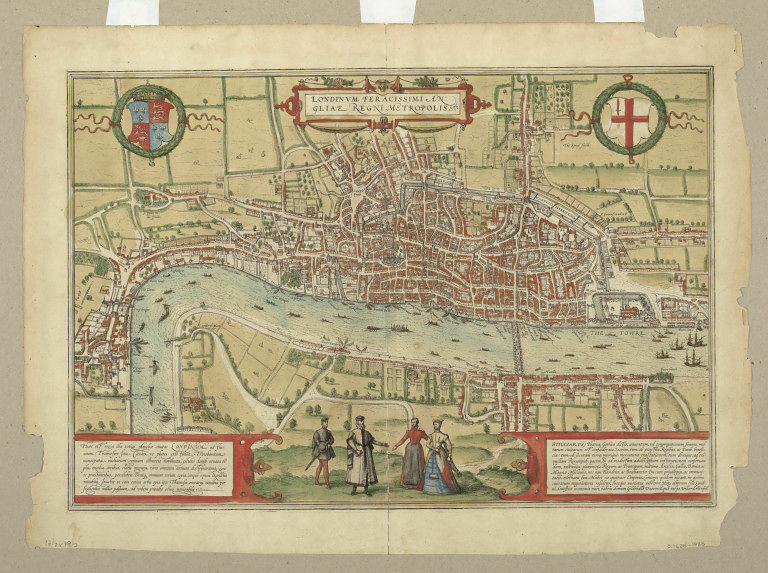 Historical significance: This is probably the earliest printed map of London. Printed map of London entitled 'Londinum Feracissimi Angliae Regni Metropolis'. Published in Civitates Orbis Terrarum, a German atlas of European cities edited by Georg Braun (1541-1622) with engravings by Frans Hogenberg (1535-1590), Cologne 1572. Hand-coloured copper-plate engraving with letterpress printing recto and verso. The map published by G. Braun and F. Hogenberg includes an image of St. Paul's Cathedral with the spire that was destroyed in 1561. This was printed in Cologne in 1572, and since it must have been originally drawn before 1561, this is therefore probably a copy of a lost English original.